My husband had a very long, busy work week last week, and we literally saw each other for probably no more than thirty minutes a day (waking hours of course) since last Sunday. Friday night, we ate at home since we were too exhausted to go out. Of course, that meant Saturday night was date night! So here’s the thing– my husband eats everything! He loves meat and seafood, and could eat Kraft Mac N’ Cheese all day long. Don’t get me wrong– he tries to keep it healthy, but when we go out to dinner, he enjoys going new places and trying different dishes. As a vegetarian, my options were always somewhat limited when dining out; however, most restaurants have vegetarian options. It was never that big of a deal deciding where to dine– as long as we avoided one, maybe two Providence restaurant with zero vegetarian options, I could always piece together a decent meal. Now that I am eating a vegan diet that’s low-gluten, dining out with my husband has unfortunately become a somewhat stressful event (for me, not him!). He’s very supportive of me, but it does cause worry about going somewhere both he and I can enjoy. For the last three weeks, we have eaten at an Indian and two Asian restaurants, where it has been relatively easy to find good things for me to eat. However, this week, he was looking to go to more of an “American comfort food” style restaurant. In fact, he wanted to go to one of my favorite restaurants in Providence– Blaze Eastside. 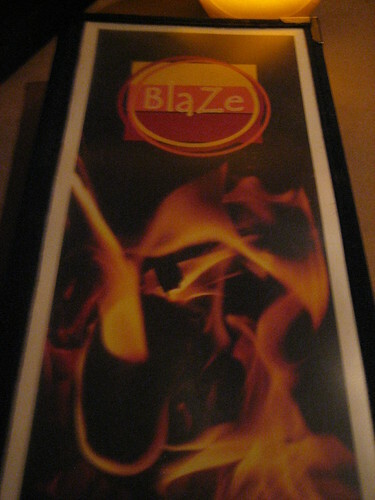 As a vegetarian, Blaze was always perfect for me– grilled pizza, pasta, salads, fries. . . there were numerous tasty options. As a low-gluten vegan– I had no idea how I would navigate the menu. I wanted to be fun and participatory– my husband and I always share appetizers in a kind of bonding experience– yet, I wanted to also stick to my convictions. Again, my husband was totally supportive, stating we didn’t have to order apps if that made it easier. I wasn’t OK with that– I heart appetizers! So I studied the menu and came up with a plan. My goal was to stay vegan, with minimal gluten, but without sacrificing the full enjoyment and experience of having a nice, shared dinner out with my man! I must give props to Blaze in that they have a separate vegetarian menu consisting of about eight items, some of which are marked as vegan. However, that night, I was not in a pasta mood, so I didn’t really want the vegan pasta with soy cashew cream sauce (which I think is a super awesome option to offer!). Nor did I want a grilled veggie platter, which I am never a fan of at any restaurant. Therefore, I decided to go rogue and piece together a legit meal from their appetizer and side dish menu. 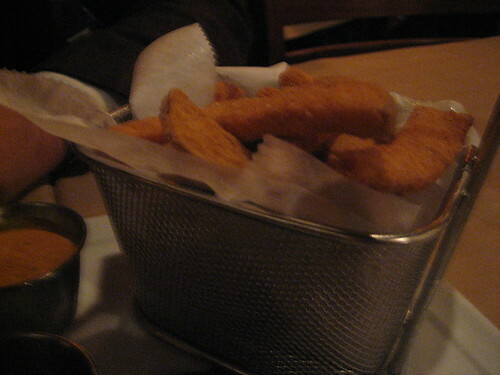 As is custom, though, we first ordered our favorite appetizer to share: what the menu deems “The Best Sweet Potato Fries Evah!” I tend to agree! I’ve blogged about these fries before– they are melt-in-your-mouth with a subtle cajun spice. They’re served with a tamarind dipping sauce, a chipotle aioli-like sauce, and ketchup. I paired my fries mostly with the ketchup, with an occasional swim in the tamarind sauce. I can’t assume these fries were gluten-free, and aren’t french fries almost always iffy in regards to being vegan (or even vegetarian) due to the oil in which they are fried? I have been a vegetarian for years, and I have eaten french fries for years, and honestly, I cannot be bogged down with wondering about things like that for my own sanity’s sake, so I won’t! They were delicious, period. Now for dinner– I ordered a trio of smaller plates so I could put together a satisfying dinner that to my knowledge met my low-gluten, non-dairy requirements. 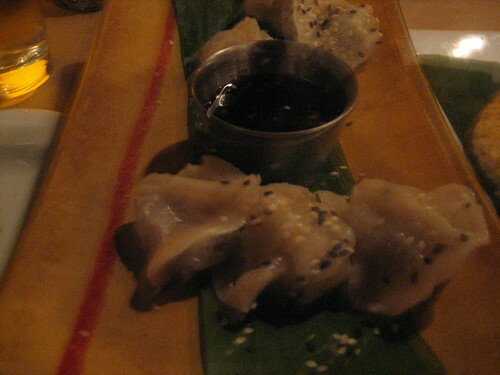 I ordered their steamed vegetable dumplings with a sesame dipping sauce off of the appetizer section of the vegetarian menu. The little dumplings, filled with veggies like cabbage and carrots and sprinkled with black and tan sesame seeds, were very light and flavorful. It was definitely a good choice, and I am pretty certain it was devoid of dairy. The other two items I ordered were side dishes, beautifully plated together. I apologize big-time for the blurry pic below– I hate taking pics when waitstaff are around, and since Blaze was so well-staffed, it was tough to snap my usual sneaky pictures. This once came out so blurry, but at least you can get a sense of what I ordered. I got their brown rice cake, which was amazing, to say the least. It was a cake of brown rice (duh!) that was crunchy on the outside and soft on the inside, seasoned with flavors of onion and garlic. 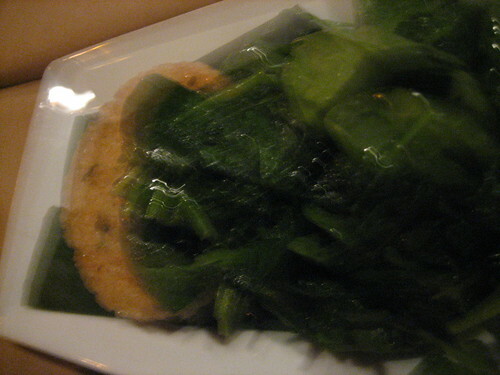 I also ordered sautéed spinach, which I requested by cooked in oil instead of butter. Eaten alongside the rice cake, the garlicky spinach and flavorful rice paired perfectly! I ate every last bit! All in all, I did the best I could within reason to eat according to how I want to eat– low-gluten, vegan, and still able to enjoy a nice dinner out without going crazy worrying about my dietary restrictions. I can have such strict control over what I eat on a regular daily basis when I eat food I prepare myself, but in order to be social and live life, I sometimes have to just be a bit more forgiving when it comes to going out to eat or eating food prepared by others. That does not mean I have to sacrifice my principles so to speak– rather I just have to the best I can. That’s what I did at Blaze– I had a great meal, but most importantly, I had a great time with my husband! Dessert, however, was eaten at home. It was beyond delicious, and definitely vegan and gluten-free. But, I will leave that for later, since this post has taken a turn for the long! Have a great Wednesday! Do you have any dietary restrictions that make dining at a restaurant tricky or difficult?